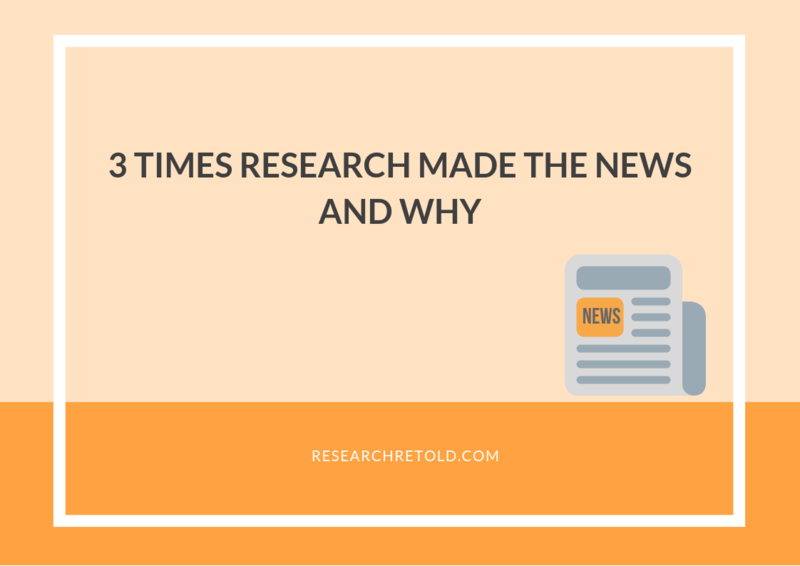 This blog post looks at three times when research made the news and the reasons behind its media coverage. These research studies offer insights into work productivity, face recognition and microplastics pollution. The relationship between researchers and journalists has been the subject of controversy. On the one hand, researchers fear that their results will be misrepresented. On the other hand, journalists need to create content that will catch the public’s attention and may oversimplify things. However, researchers also believe they could benefit from having their work published in the media. The benefits include increasing the impact of their research, generating positive perceptions of researchers by the public, supporting future funding bids, attracting a wider audience to their research, and providing a way to acknowledge academic and institutional achievements (source). Let’s explore three times when research made the news and why that may have been the case. Most importantly, we’re also able to share the views of the researchers themselves, who were kind enough to reply to our email! The University of Loughborough and Leicester conducted a research study looking at how working at a standing desk increases productivity. The research assessed 146 sedentary NHS staff through a multicomponent intervention. The results highlight the productivity benefits of standing desks as well as alleviating health issues, such as reduced muscle pains and anxiety, thus improving their quality of life. 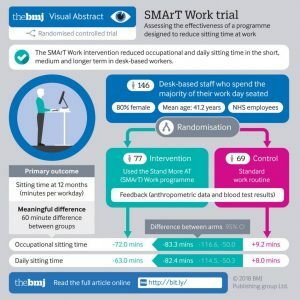 This study was published in the British Medical Journal on the 10th of October 2018: ‘Effectiveness of the Stand More AT (SMArT) Work intervention: cluster randomised controlled trial’. It was covered by the BBC on the 11th of October 2018: ‘Standing-desk workers ‘less tired, more engaged‘. Why do we think this research made the news? First, visuals. There is a visual abstract on the British Medical Journal webpage where the research is published. It summarises key aspects of the study population and the main outcome results. Furthermore, and importantly, the graphic is visually appealing, easy to understand, and concise. Second, interest. We believe the research made the news because it covered a topic of public interest. We spend almost half of our waking hours in the office. Therefore, we care about spending this time as healthily as possible. Moreover, this research can inform changes in the workplace on a global scale, namely, improve work productivity and reduce costs to business. Finally, university exposure. The research team was proactive, publishing a press release on the Diabetes Centre website, with the catchy title: ‘SMArT Work: Stand More at Work’. We think this raised the researchers’ profile and maximised their visibility and accessibility. I think this research made the news because height-adjustable desks are becoming more popular in workplaces. We were able to show in a robustly designed study that employees who received an intervention, which included a height-adjustable workstation and resulted in staff standing more, led to benefits which are important for an employer. 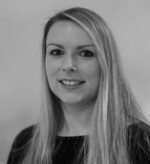 For example, job performance and how engaged staff were in their work, as well as benefits for costly issues such as back pain and sickness presenteeism. The only formal visual used was the visual abstract created by the journal. This made it very easy to understand the main aspects of the study in a very short period of time. Pioneering research from the University of York discovered that people can recognise around 5,000 faces. The researchers asked volunteers to list faces from their life and famous faces. Further, the volunteers were then asked to recognise photos shown by the academics. In order for it to count, volunteers had to recognise the face from two different photos. The study was published in The Royal Society – Biological Sciences on the 10th of October 2018, ‘How many faces do people know?’. The Guardian covered it on the same day, ‘Psychologists’ face off reveals humans can recognise 5,000 people’. First, visuals. Similar to the first study, the journal webpage contains an appealing graphic. The team also created some simple and concise illustrations. We also found a 2-minute explanatory video of the research, picked up by Science. By using different formats, the team maximised the reach and accessibility of their findings. Second, timing. Technological advancements are increasingly making facial recognition a mainstream feature of our devices. As a result, we are becoming more and more comfortable with its use and application. The research is topical and relevant for how people engage with technology today. Moreover, the findings have the potential to contribute to future improvements in automatic face recognition technology. Finally, university exposure. This team was also engaged with their media team to publish a York University press release, with a catchy title: ‘Never forget a face? Research suggests people know an average of 5,000 faces’. I think the media picked up the research because we sent out a press release – from the university press office. Quite a lot of work went into that, and they were very helpful. The topic itself is inherently interesting – we all use faces to recognise each other, so there’s a direct connection between the research and one’s own experience. I’m lucky to work in a field like that – which is both personally and scientifically interesting. We did prepare some very simple illustrations to disseminate. In fact, others (like Science) picked up on the story and produced much more impressive visual, and video, descriptions. I think some of the media coverage came through that, i.e. through a secondary source. The University of Leeds conducted one of the first studies to determine the potential sources of microplastics pollution. The researchers found that microplastics in UK rivers are in higher concentration downstream from wastewater treatment plants. The research team analysed pollution concentration upstream, and downstream, from six wastewater treatment plants in Northern England. The outcome of the study was that the concentration of microfibers was up to three times higher downstream of the treatment plants. The research was published in the Springer Environmental Science and Pollution Research journal on the 7th of June 2018. ITV News reported it on the 11th of June 2018. First, novelty. This is one of the very first studies to look at the source of microplastics in rivers. The researchers examined 28 river samples from six different field sites across Northern England. Specifically, the treatment plants varied in terms of how many people they served, the technologies used, and the characteristics of the rivers. This varied analysis shed light on how different factors could affect the extent to which wastewater treatment plants pollute rivers with microplastics. Second, interest. A quick search on Google for ‘microplastics in rivers’ generates almost half a million results. Clearly, this is a popular topic and the impact of microplastics on the environment is an issue the public wants to know more about. Finally, university exposure. These researchers collaborated with their media team and issued a press release on the university homepage, with the title ‘Wastewater plants are a key route into UK rivers for microplastics’. I think the key reason this research made the news is that microplastics are so fashionable at the moment. This was one of the very first studies to look at them in river catchments rather than the oceans where they end up. It was difficult to provide anything very visual related to this work as most samples contain a small number of plastics, some of which can only be seen under a microscope, and this has hindered further publicity, with the media tending to want dramatic pictures. 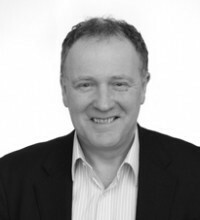 Many thanks to Dr Charlotte Edwardson, Prof Mike Burton and Prof Paul Kay for offering their insights for this blog post! Special thanks to Anca Coman, our Outreach Communication Officer, for contributing to this blog post with research, editing and outreach to the authors. Which research study do you find most interesting?